From protecting yourself from enemy combatants to finding dinner for your family, weapons have played a significant role in Virginia history. 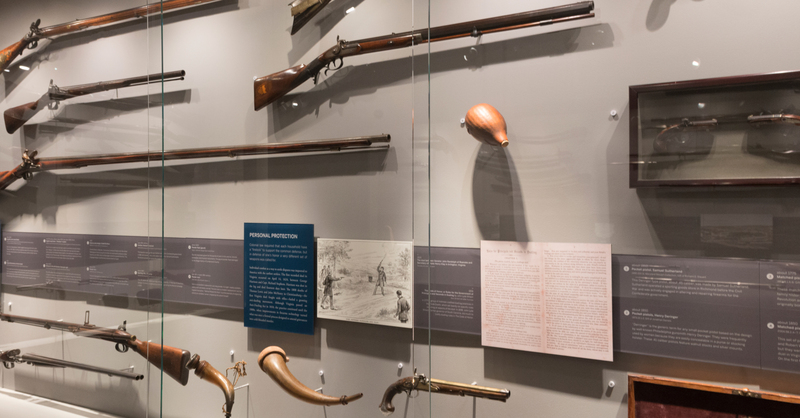 Our newest exhibition, Arming the Commonwealth, made possible by the Cecil R. and Edna S. Hopkins Family Foundation, explores how the state became a hub for weapon manufacturing and how Virginians used them in their everyday lives. Following the American Revolution, Virginia was the only state to arm its militia fully with locally manufactured weapons. In its short operational history, the Virginia Manufactory of Arms produced more than 58,000 muskets and bayonets, 10,000 swords, 4,000 pistols, and 200 artillery pieces for the state militia. Later, the U.S. Congress, recognizing the problem with relying on foreign countries for weapons, designated two sites for armories. One was Springfield, Massachusetts; the other was Harpers Ferry, Virginia (now West Virginia). English Long Fowler (“Woodson” musket), mid 17th century, Barrel; about 1750, Lock; about 1800, Stock, VHS accession number: 1929.8 (On loan from Charles Granville Scott and conserved with gifts from Woodson descendants). By Woodson family tradition, the oldest part of the gun was used by Lt. Col. Thomas Ligon, who helped Sara Woodson defend her Prince George County home from an Indian attack on April 18, 1644. When it was too hot to play sandlot baseball or football, I’d spend most of those hot summer days heading to the pool or going to the local sports card store. As my wife will tell you, I’m not much of a pool person, so the card shop was my choice. The card shop provoked my senses like a baseball game. There was the smell of the newly opened pack of cards, not the newly mowed grass. There was the sound of the chatter between a patron and the shop owner about a potential trade, not the sound of the crack of the bat. And there was the sight of the rare rookie card under the glass, not the sight of the home run going over the fence. These all stirred my senses. Whether I was searching for a Jerry Rice rookie card in a pack of Topps cards, trying to complete my set, or looking to trade a Yankees card for one of my favorite Braves players, I always had a wonderful time. Times have changed and card shops are fewer now that eBay has provided an online venue for card trading and sales. This weekend I’ll get to rekindle my childhood journeys to the local sports card shop, when Bill Hall (former sports card shop owner) comes to the VHS and brings more than 800 cards from his collection to discuss the “History of Football Cards.” The program takes place at 10:30 a.m. and is repeated at 2:00 p.m. on Saturday, July 16. Tickets range from $4 to $12. Bill Hall has been collecting for more than sixty years and has been featured in several newspaper articles and owned three sports card shops. In 1981, he presented a sports memorabilia exhibition at the Smithsonian’s Museum of American History in Washington, D.C. Come to the VHS on Saturday, July 16, to revisit your childhood (or adult) hobby and see more than 800 football cards from the collection of Bill Hall. “History of Football Cards” takes place at 10:30 a.m. and is repeated at 2:00 p.m. on Saturday, July 16. Tickets range from $4 to $12. Purchase your tickets now for the History of Football Cards. This event is a special exhibition program related to the current exhibition, Gridiron Glory: The Best of the Pro Football Hall of Fame. With Fathers Day right around the corner, I thought I’d share with you some great opportunities at the Virginia Historical Society (VHS) for those dads who are sports fans like me. Here’s a list of several sports-related items and programs that the VHS has to offer and would make great gifts for dads! The Pro Football Hall of Fame has come to the VHS. Gridiron Glory: The Best of the Pro Football Hall of Fame is on display until September 4. If your dad loves Sundays because of Pro Football, then he’ll love this exhibition, which features 200 artifacts from the Pro Football Hall of Fame. No matter what his favorite team—Pittsburgh, Green Bay, Washington, etc.—he’ll find something to enjoy in this fascinating exhibition. Gridiron Glory also has several interactives and hands-on activities that will entertain all members of the family. Purchase your tickets now for this special exhibition. Baseball game at the C&O Railway Field Day in Richmond, VA in 1923. Photo by Walter Washington Foster. Accession number 1991.1.43541. It’s the 150th Anniversary of organized baseball in Richmond and we’re celebrating at the VHS. Our national pastime has had a rich history in Richmond, and Scott Mayer will be at the VHS at the end of June for a two-part class on “Baseball History and Richmond.” He’ll discuss the origins of the game, what impact the Civil War had on it, the locations of Richmond’s professional teams, and the evolution of the modern game. Join us for a fascinating class on our national pastime’s link to Richmond. Purchase your tickets now for this class. Most dads collected sports cards at sometime in their lives. Join us at the VHS for a discussion on the History of Football Cards. Bill Hall (sports card collector and former sports card shop owner) and Greg Hansard (Manager of Web and Digital Resources and sports enthusiast) will take you through the history of football cards from early tobacco cards to the modern era of Topps. This class will be offered at 10:30 a.m. and repeated at 2:00 p.m. on Saturday, July 16, and will feature more than 300 football cards from the collection of Bill Hall. Learn more about this event. Our Museum shop is loaded with sports related books and merchandise. Here are my top five picks for dads. Edited by John Thorn (creator of ‘Total Football’) and Joe Horrigan (Pro Football Hall of Fame), this beautifully bound book is a great keepsake for any serious football fan! Sip your daily coffee surrounded by the best of the best when you drink from this Hall of Fame Legends Mug. Filmmaker Phil Wall documents the story of the 2011 Virginia Commonwealth University men’s basketball team. Eric Allen Hall has created an intimate, nuanced portrait of a great athlete who stood at the crossroads of sports and the struggle for equal justice. Scott Mayer and W. Harrison Daniel discuss the players and owners and also the nearly twelve-decade relationship shared by the team and the city. A VHS membership is also a great gift for dads. Discounts on museum shop purchases and programs, and free admission to our exhibition galleries are just some of the great benefits of membership. Purchase a membership for dad today! Greg Hansard is the Manager of Web and Digital Services at the Virginia Historical Society. Read other posts by Greg. I am in charge of HistoryConnects, the distance learning and digital outreach initiative of the VHS. This includes live, interactive programming, our online teacher institutes, and creating and sharing digital educational resources with our audiences here in Virginia, across the country, and all over the world! I keep a map in my office that shows all of the places in the U.S. that we have reached through HistoryConnects. 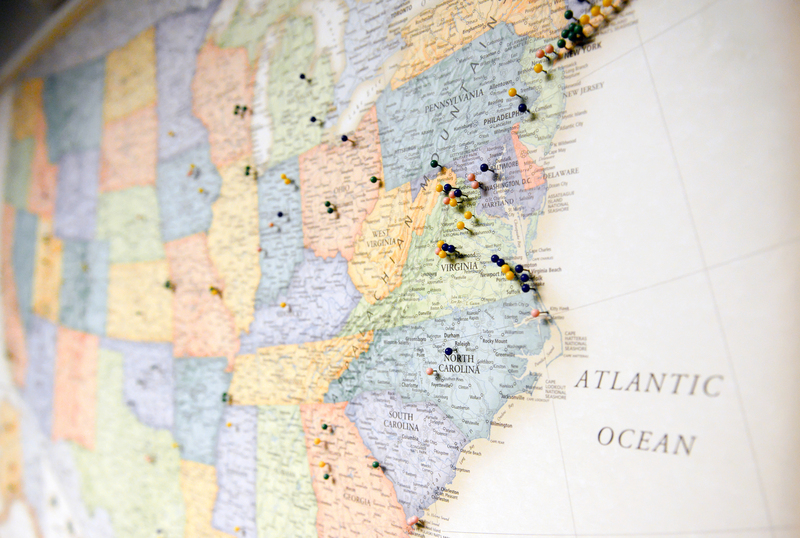 The list of locations expands every day! 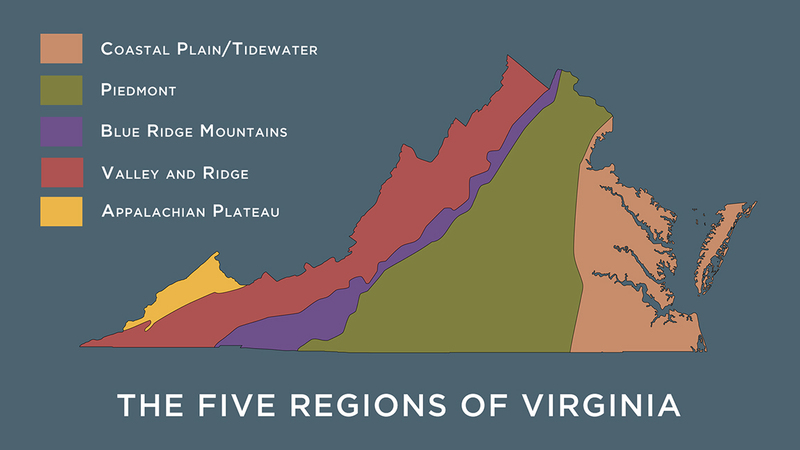 What Are the Five Physical Regions of Virginia’s Geography? Potomac Marsh, about 1890–1900, Max Weyl, 1997.178, Lora Robins Collection of Virginia Art, 1997.178. This marshland along the Potomac River is an image of constancy and renewal. The region has not been changed since the colonial era, when George Mason developed parts of it into his plantation, Gunston Hall. It is now Mason Neck State Park and Mason Neck National Wildlife Refuge, a habitat for more than 200 species of birds and waterfowl. Washington’s House—Mount Vernon, about 1845, Victor de Grailly, Lora Robins Collection of Virginia Art, 1994.116.2. Mount Vernon is situated beside a large river because George Washington’s plantation was an active agricultural operation with produce to export via ship and goods to import. De Grailly, an artist in France, based his rendering on an engraving and mistook distant cloud banks in his print source to be mountains on the Maryland bank of the Potomac River. In actuality, no mountains are there. Liberty [Bedford] and the Peaks of Otter, 1855, Edward Beyer, Lora Robins Collection of Virginia Art, 1995.2. In the Piedmont, Thomas Jefferson anticipated the development of market towns like Liberty that were small and close to nature and thereby free of the evils of large urban centers. This agrarian harmony, he reasoned, would provide a beneficial environment for an enlightened populace. Sheep in the West Meadow, 2001–2, Andrei Kushnir, gift of Andrei Kushnir, 2004.317. The northernmost portion of the Piedmont—the area north of the Rappahannock River— rises to only 400 feet and is characterized by its remarkably fertile soil and lush, picturesque landscape. Artist Andre Kushnir found in this scene at an historic farm in Fauquier County the survival of an old Virginia tradition of rural living in an idyllic setting. Afternoon, Hawks Bill River, Blue Ridge Mountains, about 1908, John Ross Key, Lora Robins Collection of Virginia Art, 1998.91. John Ross Key depicts part of the region of 190,000 acres that in 1935 would become the Shenandoah National Park. By celebrating the beauty of a remarkable landscape that was fast disappearing, Key actually helped to provide the impetus for its preservation. Natural Bridge, 1882, Flavius Fisher, Lora Robins Collection of Virginia Art, 1995.98. By 1882, Natural Bridge was famous and accessible to tourists. They saw it as a spectacular but not a mysterious site created by some unfathomable cataclysmic event. They understood that a cavern produced by erosion had mostly collapsed, leaving Natural Bridge as a remnant of a much larger vaulted roof. The Passing Storm, Shenandoah Valley, 1924, Alexis Fournier, Lora Robins Collection of Virginia Art, 1996.172.2. Fournier, a Minnesota painter who in 1893 had traveled to Paris for training, adapted French Impressionism to the idyllic setting of the Valley. He shows that nature is always renewing itself and, in turn, the spirit of those who depend upon the land for their well being. Mossy Creek, about 1900, Hubert Vos, Lora Robins Collection of Virginia Art, 1996.28.7. Vos was from Holland, where three centuries earlier the telescope and the microscope had been developed. He brought to Virginia the Dutch interest in perceiving and recording fact and discovering the rightness of nature. That appreciation of peaceful and simple rusticity resonates in the Valley. October at Tipple Mine no. 52, Dante, Virginia, 2015, William Jameson, courtesy of Warm Springs Gallery, Charlottesville, Virginia. Artist William Jameson includes in this image several of the distinctive characteristics of the Appalachian Plateau: its mountainous quality, forests, and varied terrain. At the same time, he provides evidence of both the beauty of the region and the abundant natural resources that shape its economy. Among those opposed to the act was Landon Carter (1710–1778) of Richmond County. His form of protest was more personal. When he directed his agent in London to purchase several tablespoons for his home, he ordered that if the Stamp Act was repealed, the spoons should be made of silver. If the act was not repealed, the agent was to send him cheap bone or horn spoons. The act was repealed on March 18, 1766, and Carter’s agent had the silver spoons engraved with Carter’s initials, the date 1766, and the triumphant inscription “Repeal of the American Stamp Act.” The controversy over the Stamp Act brought to light a growing schism between the colonists and their king. The Virginia Historical Society has been collecting since 1831. Included in our unique collection are 8-million processed manuscripts, 200,000 books, 290,000 prints and photographs, and 32,000 museum objects documenting the daily lives and times of all Virginians. The object featured here offers one opportunity to look into the past. Millions more treasures await you at our headquarters in Richmond, by appointment at Virginia House, and online at vahistorical.org.